Lex Review. Last's week word was UGLY, this week it's EFFICIENT. Top of that list was QB Kyle Lichti. A very efficient performance for the junior. He completed 64% of his passes, threw for 2 TD's and no picks. If he can be anywhere close to those numbers consistently, this team becomes incredibly dangerous. Great effort from Kyle just one week after a game he's probably already forgotten about. Defense was once again rock-solid. The 1 Lex TD was a bit fluky and could have just as easily been a turnover. Their other was against our second team. That was a talented Lex team which was picked to finish 2nd in the OCC. Hopefully they string some wins together from here on out. Can't look back on this game without mentioning the effort of Mason Monheim. He finishes with 250-ish rushing yards if not for an 82-yard TD being called back. He still finished with nearly 175 yards on 17 carries and 2 TD's. Oh, and he also stripped AJ Bryne and returned it 23 yards for another score...all in the first half. Not a bad night. What impressed me what his speed. We've all seen him run over guys, but he had pull away speed to go with that power running. Just very pleased overall with the effort and the focus. Whatever was done leading up to the game needs to repeated weekly for the next few months. Here's another YouTube Video, a photo slideshow from Daily Record photog Dan Starcher. 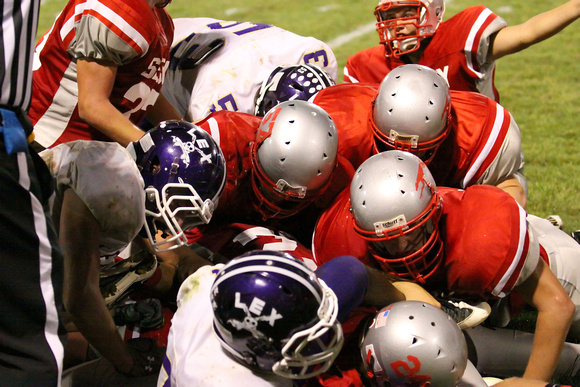 Lex Helmets. Maybe no one noticed but me...but it looked from my vantage point, that Lex had changed their helmet decal from their classic Mount Union inspired helmet, to something new for 2011. ...and here's what they look like this year. I kind of like. It's unique. Gutsy. Wanted to also mention the gutsy performances by seniors Drew Brenner and Stewart Turner. Both were banged up but gutted it out for the good of the team and both found the endzone as a reward. 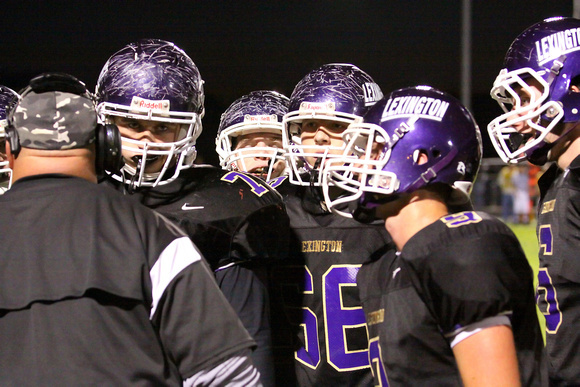 Coach Davault has said it many times, it's a team effort, but it's up to the seniors to lead. Both Brenner and Turner did a great job of leading by their actions Friday night. OCC. In the other three OCC games, Ashland rolled over Wooster, West Holmes hammered Madison and Clear Fork held off Mansfield Senior. Seems like the league is going through Ashland again this year. 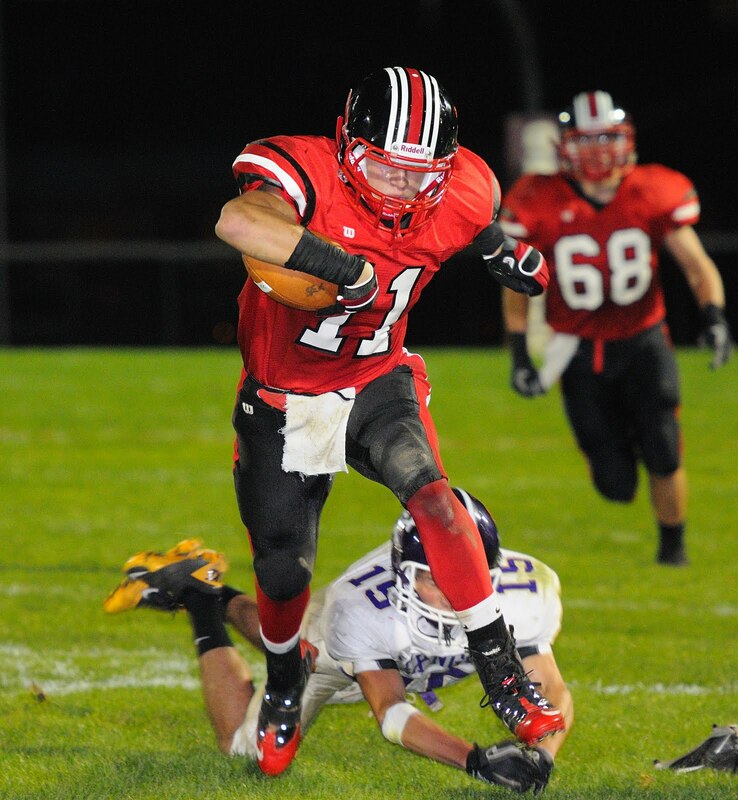 Orrville will get their shot against the Arrows in week 7. Tough loss for Mansfield as they lost their star running back Terrell Dorsey to a broken ankle. Region 13. The latest "unofficial" computer point standings are out courtesy of JoeEitel.com, and Orrville is back in the familiar territory of the top 8. Right now they sit 5th and would face 4th seed Canton Central Catholic in a first-round playoff matchup. Norwayne Chatter. It was only a matter of time until the "Norwayne-Orrville" playoff talk started, and Aaron Dorksen's article in Sunday's paper will make sure it will be a running topic for the next 6 weeks. I'll just say this...I really hope it happens, it would be good for the area. But each team has 6 games left and lots can change. Norwayne should waltz into their week 10 showdown with Hillsdale, while Orrville has a considerably tougher road to week 10 and a possible OCC title. Sure, Norwayne plays a weaker schedule, but it doesn't mean they aren't any good. I think Norwayne's season comes down to one game...the week 10 game against Hillsdale. If they lose that game, they still make the playoffs, but probably as a 5 or 6 seed. If they win that game, they're a top 4 team. With Rittman, Chippewa, Dalton and Northwestern all winless through 4 weeks, it's just not a lot of 2nd level points for them. If they slip up and get beat by Smithville or Waynedale before week 10, they could be in a must-win situation just to make it to week 11. Their margin for error is that small. I've said many times before, there's a reason Orrville hasn't faced a Wayne County team since 1981, it's because 9 times out of 10, we win the game, and we'd rather play up as we've done for decades. Proof is in the pudding when we've been to the playoffs 21 times. There is that "Once a Decade Team" that could give us a run for our money...and this year's Norwayne team just might be that team. My prediction is that both of us finish in the top 5 and meet in the 2nd round of the playoffs at the earliest....but how cool would a first-round matchup at Orrville be? Tim Hiller Update. Missed this one last week, but belated congratulations to Orrville grad and Gull Lake (MI) head coach Tim Hiller on his first career win as a head coach. His Blue Devils beat South Haven 36-14 in Week 3 and just this past Friday beat Three Rivers 59-20 to even their record at 2-2 on the season. Erin Short. Saw this excellent article in the Eastern Echo, the student newspaper of Eastern Michigan University. It's a profile of Orrville grad and EMU sophomore Erin Short. The Eagles are 12-2 on the season, losing only to BYU and Notre Dame. Erin has started all 14 games on the season. New HS Animation. Thought this was cool. A computer animation of the new high school currently under construction. At the end of the video you see buildings in white...that's the existing auditorium, gym and industrial tech space that will be renovated and remain a part of the new high school footprint. Be back on Wednesday evening for the Mansfield Sr. preview.